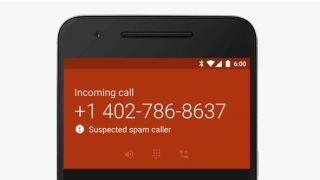 Spam calls are one of the biggest annoyances that can come with having a phone glued to you at all times, but now Google is taking a stand against them, by adding spam protection to its Phone app. The feature is available with the latest version of the app on Nexus and Android One devices and once activated it adds on to the existing Caller ID system to bring up a red warning box saying "suspected spam caller" whenever a nuisance call comes through. As well as giving you advance warning that you might not want to pick up, it also gives you the option to block the number so you'll never have to deal with it again, or whitelist it if you don't consider it spam. Sadly, it won't stop the calls coming through in the first place, but some countries have a mechanism for this, such as the Telephone Preference Service in the UK, which you can now opt into with just a text. As the Google Phone app is limited to devices like the Nexus 6P and Nexus 5X this new spam detector won't help owners of other popular handsets like the Samsung Galaxy S7, but some phones have a similar feature built in and if your phone doesn't there are a number of third party apps such as Truecaller which do the same job. Still, it's nice to see Google taking a proactive stance. Hopefully one day soon this will be a standard feature in all phones and spam will become a problem of the past.